The Josiah H. Penniman papers were transferred to the University Archives in 1968. Originally, the collection included both administrative files and Penniman’s personal and family papers. The latter part has been set apart and re-classified under UPT 50 P 414. The collection has been arranged alphabetically. The General Correspondence has been maintained in its original order of being filed alphabetically either by the initial of the name of the correspondent or by subject. 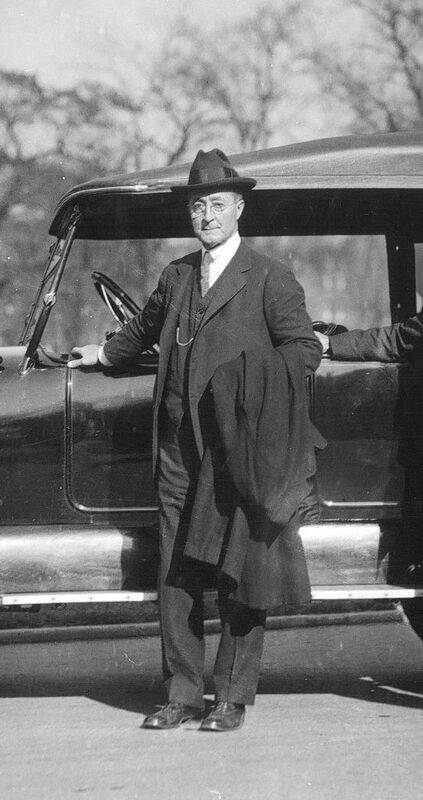 Historically, before the final establishment of the institution of the Office of the University President in 1930, the Provost used to be the head of the University of Pennsylvania responsible for both academic and administrative activities of the School. Quick growth of the University and great expansion of the scope of its multifarious activities gave rise to the need for some fundamental changes in the mechanism of the school leadership. In the decade from early 1920s to early 1930s, the University went through a zigzag course in exploring for an appropriate way to reorganize its leadership system. The twists and turns in the course underlined a struggle between the forces in favor of the changes and the resilience of the existing order. The movement began in the election of General Leonard Wood as the chief executive of the University of Pennsylvania in March 1921. In nominating General Wood as head of the University, the Board of Trustees left two points open. One was what title the General was to be given. The consensus was that Penn should join Yale and several other universities to create a new office of the University President. The other point undecided was the relationship between the office of the President and the office of the Provost. With the second point, the Trustees resolved at the same meeting for the nomination of General Wood on March 21 that the “scheme of administration for the University” was to be decided between General Wood and the Acting Provost Josiah H. Penniman on the return of the General from the Philippines. The Trustees stressed, however, that the educational interests of the University “shall take precedence of everything else” in the University government. The uncertainty over the relationship between the two leading University offices apparently pleased neither the President-to-be nor Josiah H. Penniman who had been Acting Provost since the retirement of Edgar Fah Smith in 1920. From his nomination in the spring of 1921 to late 1922, General Wood extended his leave of absence again and again. In December 1922, Wood formally tendered his resignation “in view of the impossibility” of giving a definite date for his return. The initiative to have a new office of University President, however, continued. In December 1922 the University Trustees decided that “in recognition of the great growth and development of the University and its activities,” the University was to create the office of the University President as the “Executive and Administrative Head of the University” while re-defining the office of Provost “as the Educational or Academic head of the University.” The proposal conceived the idea of having two separate and parallel institutions, for the Provost was to have “all of the powers, duties and functions heretofore vested in and devolved upon the Provost, which shall not be vested in the President of the University.” A Special Committee of Five Trustees was formed for further discussion of the duties of the two Executive Officers, the changes in the existing Statutes necessitated by the creation of the new Office of President and the selection of a suitable person to fill the office. In its report to the Trustees in January 1923, the Special Committee of Five expanded the responsibility of the Office of the University President by re-defining the University President as “Head of the University.” The Trustees adopted the report and appointed a committee of four to approach the incumbent Provost for his endorsement of the change. Although, in January 1923, Provost Penniman nominally accepted, “after prolonged discussion [with a Committee of Four] and much consideration,” the new arrangement as well as his election as Provost “in accordance with the report of the Special Committee of Five,” he later asserted his position to the Trustees more than once that “the educational head of the University ought not to be subordinate to any other official.” To keep his service, the Trustees, instead of finding a new person to fill the office of President, selected in July Penniman President of the University of Pennsylvania, who was in the meantime requested to “act as Provost until a new Provost shall have been chosen.” As Penniman was now President and Provost concurrently, the Trustees raised his annual salary from $15,000 to $25,000 in November 1923. The momentum for change surged again five years later. In January 1931, the Trustees approved the revised Statutes of the University. The new Statutes stipulated that the collective of University Officers consisted of “a President, a Provost, four or more Vice-Presidents, a Treasurer, a Secretary, a Comptroller, a General Counsel, a Librarian and such a number of Deans and Directors as the Trustees may from time to time approve.” The Trustees, again, made the President of the University “head of the University” to whom “all officers of the University shall be responsible.” The role of the Provost was re-defined as “the senior educational officer of the University” who “shall be a member of every Faculty of the University” and “shall advise the President upon the educational policies and development of the University.” The first person elected to the newly-defined head position was Thomas S. Gates while Josiah H. Penniman retained the position of Provost. This collection documents the operation of the Provost Office under the administration of Josiah Harmar Penniman, 1921-1939. Also included are files from Penniman’s office when he was Vice Dean of the College, 1896-1897; Dean of the College, 1897-1909; and Vice Provost, 1911-1920. The bulk of the collection is in general correspondence. Among the major correspondents were former Provosts Charles Custis Harrison and Edgar Fah Smith, Vice Provosts George A. Brakeley and J. Hartley Merrick, Treasurer F. Corlies Morgan, Secretary of the University Edward W. Mumford, Comptroller William E. Mikell, Dean of School of Education J. H. Minnick, Dean of Medical School William Pepper, heads of various academic departments, and Director of Placement Service C. E. Clewell. The subject of the correspondence covers a wide range from academic and financial matters to the planning of the development of the University. Other important files of the collection are Addresses and Articles, reports and correspondence to the University Trustees, and Weekly Calendar. Addresses and articles include commencement addresses, opening addresses of each academic year, and addresses Penniman made on various occasions to mark major events on campus. The Weekly Calendar continues from 1911 to 1938 and carries Penniman’s notes on his schedule. The collection also includes a small collection of books and other publications kept by the Provost Office for reference. Benjamin Franklin and the University of Pennsylvania n.d.
Furness, Horace Howard, Jr., Will n.d.
Letter to the Alumni of the University of Pennsylvania – 1925, and Notes on the Present Situation at the University of Pennsylvania n.d.
Morgan, F. Corlies, Treasurer n.d.
Mumford, Edward W., Secretary 1925 June – Dec.
Mumford, Edward W., Secretary 1926 Jan. – Sept.
Mumford, Edward W., Secretary 1926 July – Dec.
Trans-Atlantic Telephony, Transcript of a conversation between Provost Penniman in Philadelphia and Lord Dawson in England, with newspaper clippings 1927 Jan.
Trustees Executive Board, minutes 1928 June – Dec.
University of Pennsylvania, Statutes of the Corporation n.d.